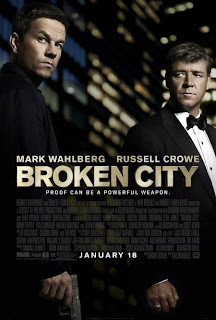 I won’t bury the lede: the only thing less inspired than BROKEN CITY’s dime-store paperback title is its used-up flophouse mattress of a plot. Directed by Alan Hughes (THE BOOK OF ELI) from the first produced screenplay by writer Brian Tucker, the film is bland, overlong, and borderline nonsensical, offering the most facile of underdog fantasies: a single working-class schlub who, with the aid of a little elbow grease and whole lotta moral outrage, single-handedly challenges the cartoonishly corrupt mayor of New York City. If only it were lousy enough to be remarkable – a concerted train wreck or an unintended cult classic. Alas, lazy dialogue, mediocre performances, hum-drum action sequences, and a conspiracy plot that substitutes convolution for intelligence ensure that it’s the most mediocre form of crap. Mark Wahlberg (TED) plays Billy Taggart, a disgraced cop turned hang-dog P.I. who’s pulled into a web of political corruption after being hired by Mayor Hostetler (LES MISÉRABLES’ Russell Crowe) to sniff out the man he believes is sleeping with his activist wife, Cathleen (ROCK OF AGES’ Catherine Zeta-Jones). Of course it’s an election year, and the intrigue extends far beyond simple marital infidelity. If it wasn’t bad enough that the linchpin of the corruption storyline feels straight out of a ‘90s SNL film – the mayor selling off the city’s largest housing project to a private development firm – CITY’s portrayal of the mayoral race reduces both economics and politics to cave painting simplicity. We know from the outset that the charismatic Hostetler is a mean ol’ Scrooge McDuck selling the city down river while trumpeting the common good, just as we know that his adversary, the soft-spoken, weird-looking Jack Vallient (FLAGS OF OUR FATHERS' Barry Pepper is an honest do-gooder (Get it? 'cuz his name is #$%^ing Vallient) who’s looking out for the city and its people. At a time when LINCOLN brilliantly (and humorously) demonstrated how the ethical flexibility of our ideological leaders has, at times, been the savior of our country’s moral core, this heroes and villains bunk simply doesn’t fly. To be clear, it isn’t the promise of possible social change I resent - the theme of marginalized cog refusing to spin its expected course, thereby undermining the larger, insidious machinations of tarnished clockwork, is a classic trope of proletariat literature (and watch-themed erotica). I abhor the oversimplification of the enemy, and the assertion that the oppression of the lower class can be attributed to mustache-twirling, flesh-and-blue-blood villains rather than a complex, self-perpetuating system of socio-cultural failures at all economic levels. But Americans love to turn their elected officials into scapegoats. Certainly politics is filled with empty rhetoric, broken promises and, in the extreme, corruption, but all BROKEN CITY shows us is that it’s much easier to end the conversation there than to explore the systemic mechanisms that allow these iniquities to sustain and repeat across history. Even working from such an immaturely jaded perspective, the film would be much more effective were it to force the audience to identify with the thousands of manipulated voters, who the film suggests are keeping the mayor in office, rather than with the one heroic outlier who challenges him. Bottom line: it’s easy to make a theater full of Americans shake their heads in disgust at rotten political caricatures when we aren’t forced to confront the fact that we’re the ones who elect them.